18 posts categorized "Guest Post"
As part of our preparation for the City of Vaughan B2B Expo, we have published a guest post on the City of Vaughan Blog. Please visit the blog and read up on 7 tips to get the most out of the expo. You can also follow the link from the blog to register for the event. If you run a small to medium sized business this is a great event you should not miss! The Expo is a great opportunity for any small business in Vaughan to network with more than 100 local businesses. Companies will find potential customers at the booths right on the show floor. Attending the Expo is a cost-effective marketing opportunity for small businesses. We look forward to growing our relationship with the City of Vaughan and the business community by being a corporate sponsor this year. The business opportunity for cloud adoption is still very much ahead and by no means "over." 100% penetration of cloud into an organization means that the business is either "born in the cloud" or has completely transformed all their legacy, on-premise applications to the cloud. The laggard 20% in 2025 most likely are the Fortune 500 companies which may never fully go cloud for various reasons. Imagine a bank that has fully outsourced their IT to the cloud and has none of their own infrastructure -- that's pretty hard to imagine for 100+ year old banks, no? Forecasting when such a deep adoption of cloud may reach a tipping point is really a crystal ball exercise. All indications point to a 5-10 year race ahead for businesses who buy IT services, for companies that make cloud software and services and companies that manage and help customers buy. This is a clarion call that we heard loud and clear, and we were very fortunate to get this first hand at the event. We look forward to attending year over year to this critical small business cloud event listening and participating in what the best in the business have to say about cloud adoption and the business of cloud. 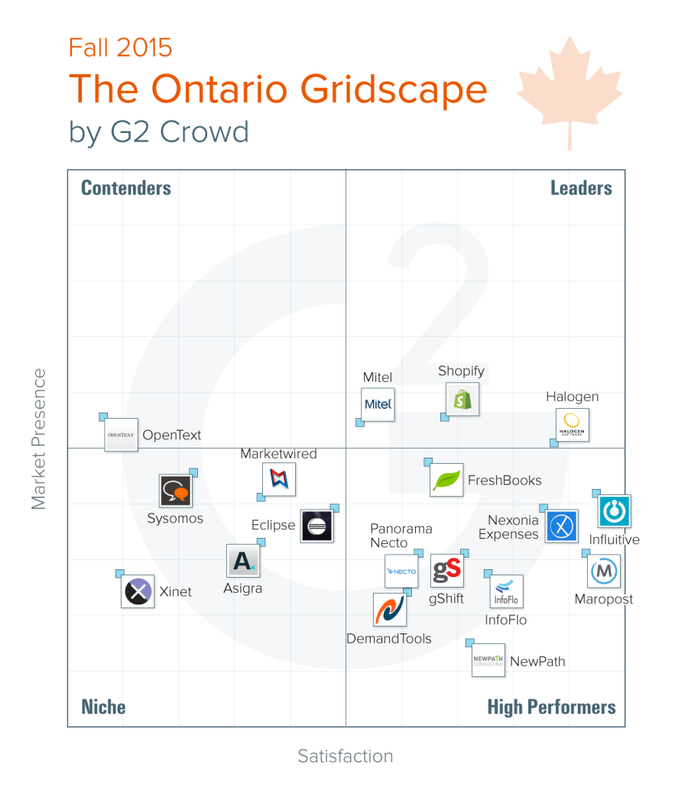 We are really excited to find out today that NewPath Consulting has been identified as a "high performer" in the G2Crowd.com Fall 2015 Ontario Gridscape. This product and service comparison matrix covers select Ontario, Canada companies who provide cloud products and services. We are honoured to be part of this group of high performing Ontario companies. As we continue to grow we look forward to reading more reviews on G2Crowd from our customers and participating in this terrific review marketplace. Here's the overall IT griscape for IT Consulting companies at G2Crowd. As a business owner, you can’t ignore technology any more than you can ignore your customers. Even if your products or services aren’t particularly high tech, the current wealth of available tools can make your workflow more efficient and boost your visibility to clients. But that abundance of technology also can be overwhelming. What tools do you really need? And how can you tell when it’s time to upgrade your current tech? Several international reports as well as a global report are available at the Parallels website for free download without registration. How Typepad Helped NewPath Consulting Launch A Responsive Website With 3 Cool Features! TypePad published some great content on how we built the NewPath Consulting website back in 2013. It's worth checking out that post again! The quickest way to improve your bottom line: Get past clients to come back! This is what we have always believed and found true: every month, the majority of revenue come from existing clients. Think about it. Who paid you the most last month? Current customers or new customers? Yet we spend most of our time, budget and effort on people who don't know us, those who are indifferent to us and our offering (at least, initially). How much more value can we create if, instead, we focus on those who know us, who has paid us and who trust in our work - our past customers. Let's see how to win back those wonderful folks. Why working on winning back old clients is better. They are familiar with your work (you don't have to spend time pitching about your better quality of work.). They know what to expect. They know you. We humans generally are comfortable to work with the people we already know. They understand and respect your working style. They know your pricing. They generally don't negotiate a lower price than what they paid earlier. If you have good reasons, you can get a higher price. Heck, they have trusted us enough to pay us. This is golden. This is the ultimate test: when someone trusts you with their hard-earned money. Provide outstanding value that they stay with you forever. Before we try to win back your old clients, it's important to find out why they stopped buying in the first place. They have found a new vendor. They have moved places. Left the job. Changed careers. They don't need your product or service anymore. They are unhappy with your service or product. If you think a particular has stopped buying from you because they are unhappy with your service, none of the following ideas will work. Fix what's broken. Then tell the client that you've fixed what caused them dissatisfaction. They might come back to you or not. But you've done your best. Now, let's see how to win them back if other reasons are at play. Offer something for free. Consultation calls. An ebook. A book. Free inspection. Free review. List of 10 ideas for them. Tell about your recent projects, and tell them how you can work together in the future. Prabu Rajasekaran is guest blogging for NewPath Consulting. He wrote this article on winning your old clients in September 2013. A very inspiring profile of a Toronto-based business called Aromachology on the Freshbooks blog. They make personalized scents and are getting some excellent buzz around their perfume bars and perfume parties. We love how Ashlee talks about learning the tools required to run their business on their own and being independent without paying hundreds of dollars to others to get it done. I wonder if they've discovered the other parts of the small business web that can accelerate and amplify their success? Customer Portrait - Aromachology from FreshBooks on Vimeo.